We have a WINNER for our SHINE girls Giving Christmas Away Prize! Yay! My husband carefully drew the name this morning...are you ready? "My favorite will always be "Away In A Manger" - It was even Lullaby that I sang to both of my babies :)"
Christa is a precious friend with an incredible voice! I am so proud of her and what she is doing for the Lord with her music! 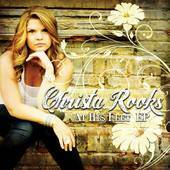 You can check out her website at www.christarooks.com. You will be so blessed by Christa's music, sweet Molli! The kids and I listen to it over and over in the car! SHINE girls, if you want to hear a sampling of the music on her CD, go to this link at Itunes and listen. Order yourself one, or order some for friends! You will LOVE her music!